↑ Collias, N. E. (1987). "The vocal repertoire of the Red Junglefowl: A spectrographic classification and the code of communication". The Condor খণ্ড 89 (3): 510–524. ↑ Evans, C. S.; Macedonia, J. M.; Marler, P. (1993). 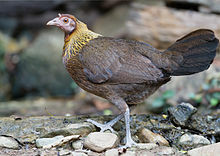 "Effects of apparent size and speed on the response of chickens, Gallus gallus, to computer-generated simulations of aerial predators". Animal Behaviour খণ্ড 46 (1): 1–11. doi:10.1006/anbe.1993.1156. Gallus bankiva (illustration) in Sir William Jardine, The natural history of gallinaceous birds: Vol. I., publ. W.H. Lizars, and Stirling and Kenney, 1834 at Google Books.